Uwe Albersmeyer studied chemistry at the University of Duisburg-Essen, completing his studies in 1997. He gained his PhD at the University's Institute for Organic Chemistry in 2002 with a thesis on quantum simulations and solid-state NMR spectroscopic analyses of hydrogen bonds in hydroxyzines and related compounds. Uwe Albersmeyer successfully founded his first company during his university days. After a short stint in the chemical industry, Dr. Albersmeyer decided to move into intellectual property law and trained to become a patent attorney at a Düsseldorf law firm. He is a chartered German Patent Attorney and was admitted to practice as a representative before the European Union Intellectual Property Office in 2007. Uwe has been on the list of professional representatives before the European Patent Office since 2010. 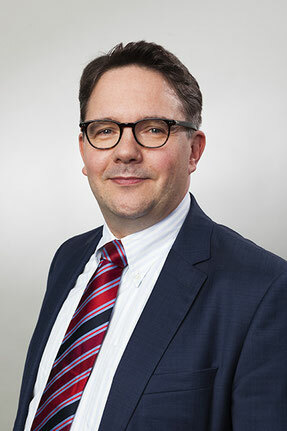 Uwe Albersmeyer joined the law firm of Michalski Hüttermann & Partner at the end of 2009. His main areas of practice are electrochemistry, material sciences and the chemistry of construction materials. He also has extensive experience in the field of power plant and environmental technology and in biotechnology. Besides acquiring and asserting technical property rights, his core work also includes trademark and design protection and issues relating to employee inventions. The management and performance of due diligence and drawing up FTO opinions also make up a large part of his work. "I like leveraging the different options to protect intellectual property in order to create comprehensive value for the client. It is great motivation when I manage to find a loophole just when it looks like nothing will work." Dr. Albersmeyer is a member of the Association for the Protection of Intellectual Property (GRUR), the Association of Intellectual Property Experts (VPP) and the Licensing Executive Society (LES). Uwe is regularly recommended in trade publications, including multiple recommendations in the JUVE Handbook. In 2016, Acquisition International recognized Dr. Albersmeyer as a leader in electrochemistry patents. Dr. Uwe Albersmeyer was born in Essen, Germany in 1970 and still lives in the city today. He is married with two children. Outside of the office, he likes to play bass guitar in different ensembles. Uwe Albersmeyer speaks both German and English fluently.